John Shaw, a native of Nevada, USA, was born in 1961 and began his career in art and graphics in the early '80s. 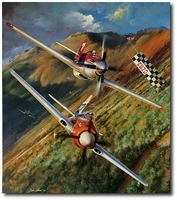 Beginning as an illustrator, Shaw created commercial artwork for a wide variety of clients, such as Lucas films Ltd, Major League Baseball, and several major entertainment software companies. 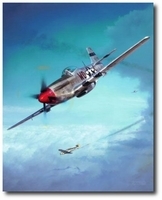 Over the last several years John has gained a loyal and rapidly increasing following for his work making him one of the most highly regarded aviation artists in the US and an exciting prospect for collectors as his reputation and talent put him firmly on the world stage. John currently resides in Florida with his wife Keli. 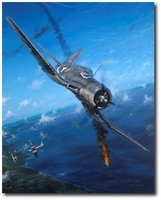 "The Magnificent Fight: The Battle for Wake Island"
One of the last AVG signed prints available! 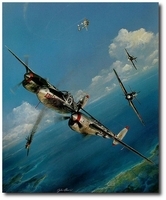 "They Fought With What They Had"